The Linn County Jail on Tuesday had two inmates with “INS Hold” after their names. The Center for Immigration Studies, an independent research organization in Washington, claims Linn County and most of Oregon offer “sanctuary” to illegal immigrants. Does this make Oregon just like San Francisco, where a felon from Mexico in this country illegally was allowed to go free and then shot a young woman dead on July 1? I can’t say, but here’s what I learned. Start with a law passed in 1987. It’s ORS 181.850, and you can look it up. It says no state or local law enforcement agency may arrest anyone only because he’s a foreign citizen in the United States “in violation of federal immigration laws.” But it also says Oregon police may exchange information with federal immigration agencies. They may also arrest anyone on a federal warrant charging a criminal violation of immigration law. The law made Oregon one of four “sanctuary” states, the Center for Immigration Studies said in a 2008 report on Operation Community Shield. This was a federal operation that rounded up more than 8,000 foreign gang members around the country, but none in Oregon. Then, in 2012 in Clackamas County, a Hispanic woman was arrested for violating a restraining order taken out by her husband and held in deplorable conditions for two weeks. The jail refused to let her be bailed out because federal immigration authorities had placed a “detainer” on her. With the help of the Oregon Law Center, she filed a complaint in federal court. And in April 2014, Magistrate Janice Stewart ruled she had been held without probable cause. A detainer stating only that ICE (the Bureau of Immigration and Customs Enforcement) was investigating someone for possible immigration law violations was not probable cause for imprisonment. Thus, she ruled, the woman’s incarceration based on only the detainer violated the U.S. Constitution. Following that ruling, most Oregon counties including Linn stopped holding people based only on ICE detainers. This May, the woman settled her claim against Clackamas County for $30,000 ($2,000 for each day she was jailed), according to the Portland Law Law Collective. I spoke to Linn County Sheriff Bruce Riley on Tuesday. He doesn’t consider Linn to be a “sanctuary” like San Francisco. While that city seemingly refuses to deal with federal immigration police, Riley’s department continues to cooperate with ICE as it has for years. What happens is that when people are taken into custody under state laws, they are questioned and fingerprinted. When it appears the person may be a foreign citizen, ICE is notified. Then, it’s up to the feds to pick the person up when the state case has run its course. This, Riley says, happens maybe once or twice a month. 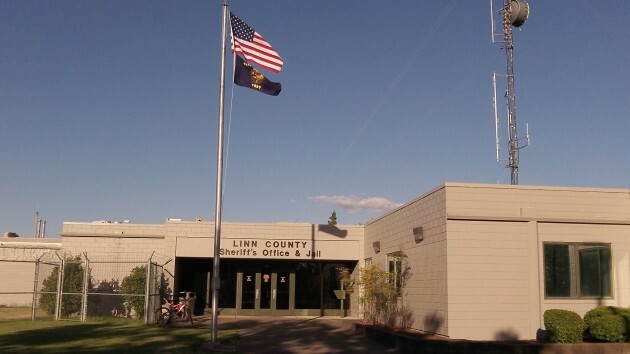 Many years ago the booking practice at Linn County Jail was to ask the person if they were a US citizen. Whatever answer was given, the booking officer wrote down. There was no challenge and ICE was not notified even if the officer suspected person was illegal. From what Bruce Riley told me, I believe it is.